The humble computer mouse is about to move in a whole new direction. 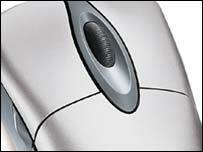 Microsoft is preparing new versions of its mouse that will be fitted with wheels that tilt as well as roll. The innovation means that users will be able to scroll horizontally as well as vertically without using on-screen navigation bars. Wired and wireless versions of the mice are due to officially announced by Microsoft in early September. Since the vertical scroll wheel was introduced, it has become a very popular way of moving quickly through documents. Now 80% of the mice sold have a centrally-placed scroll wheel. Microsoft's new mice will have the wheel sitting in a tilting cradle that means it can be used to scroll from side-to-side and help people browse documents, spreadsheets or webpages that do not fit neatly on a screen. Viewing large documents or spreadsheets usually involves recourse to the scroll bar that is usually found on the bottom edge of a window. The mice will also have a feature that lets people switch between open applications by pressing down on the scroll wheel instead of using the keyboard. Microsoft's new mice are due to go on sale in the UK at the end of September. Peripheral rival Logitech said that it had no plans to introduce a competing mouse that adds horizontal scrolling. It also questioned Microsoft's decision to stop scroll wheels clicking as they are spun back and forth. Logitech said research with consumers showed that they liked to get some feedback from a mouse when they were using its buttons.